how fun is that??!?!? i love the shape of it and am in awe that you bult it. so cool! i hopped over from cottage instincts- thanks for sharing! How cool is that! My husband is also handy - love them! I've never seen a headboard that shape, what a great look. I think it is wonderful that you found a way to make what you wanted! It has a unique look to it that I love--very modern but cozy too! Oh and don't forget to stop by today because we continue with our Show Yo' Flow Campaign, and you don't want to miss the interview we have on Stefanie and the amazing surprises she has for our readers:) See you there! Happy Monday! That looks great! So economical compared to a bed from Crate and Barrel or similar stores... Great job! This is simply gorgeous! It looks like you had someone custom make this for you! Next time I'm searching for new bedroom furniture I might have to give this a try....if I can convince my husband to help! I have a bedroom suit I want to refab but I don't like the bed. I have been looking for a padded headboard design and THIS IS IT!!! You did a fabulous job. I am going to bookmark this for when I am ready to do mine. Thanks for sharing. I wish I can do that.Where did you buy the box? Great job on the headboard. Isn't it great to have a handy husband? My husband did our upholstered headboard for our bed as well. I love ours but if ever we change I might just think about doing a wingback one. Jessica, you are so talented. I got your e-mail, like what a month or two ago. When I went back to answer you I couldn't find it. I really want to come see your gorgeous home sometime. They started on ours a few weeks ago. They have the foundation done. We live in the little 2 bedroom apartments in the ward. It's crazy, but we will sure appreciate a decent size home! I hope everything is going well. E-mail me sometime so I can have your address! It's fabulous! WOW! I love it - pretty and so cozy! Great job! Wow, that is amazing! What a huge undertaking...you did a great job! What a big project to take on and I think it's way better then buying it from the store, I mean think about the meaning behind it now, you'll always remember about the bed you built together!! (; Great job! This is fantastic. I commend you for copying it and wrapping the base in fabric. Genius. I have often thought about doing this and wondered if it was possible. You did it! and I love it! Great work! Girl this is awesome, if you used any of www.thediyclub.com sponsor products you should enter this into the monthly contest. Another competition will start in a couple of weeks. These upholstered headboards are really becoming popular. I have read that this is being credited to the furniture in Mad Men. Anyway, yours is especially handsome. 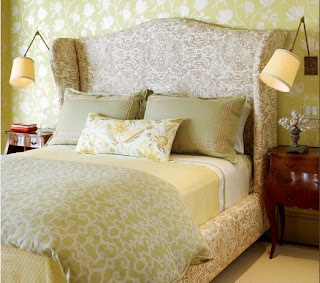 I really like the fabric you chose and it is stunning with your coverlet. Wow! Well done! Love the fabric!! The lines and style of this is beautiful. I am so impressed. Gorgeous! Thanks for linking to Tickled Pink. Hi, the bed looks awesome. I just came across it becuase I too was looking to build myself. 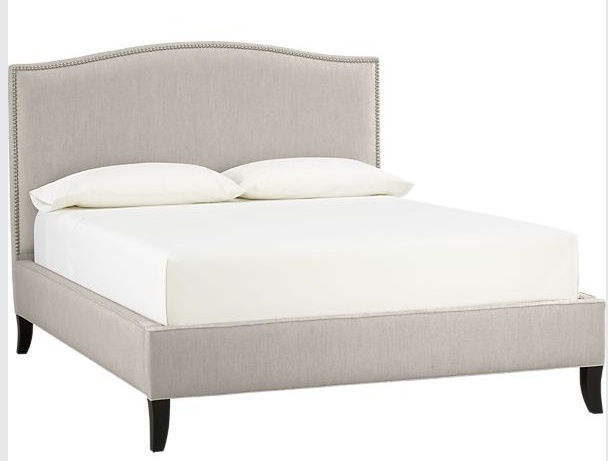 My inspiration are the bed from restoration hardware, but then again I dont want to pay a mortage just for a bed. I was wondering how much did it cost you total by doing it yourself? I'll try it out and hope that it'll come out as good as yours. I love the idea that you built this yourself. I'm planning on doing the same thing..soon! Question?-For your cut list. What size bed is it for? If you could tell me I'd greatly appreciate it. I'm going to use your instructions to build my own.